as direction is easy to bend. especially those one didn't intend. even before the leader's words have emerged. takes days and real work just to purge. as leaders on paths without ends. which makes leaders so grateful for friends. 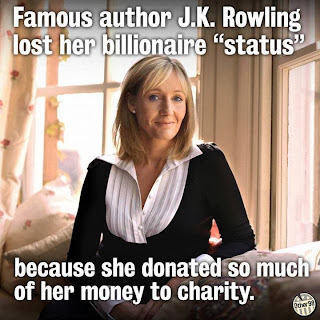 JK Rowling gave away 56 million dollars this year. That's a lot of good being done by one very good, talented, and successful person. You might, then say, that capitalism can be a redeeming force in the world. And while many do everything they can to change the world through the financial means they are blessed to achieve within a capitalist economy, this very meaningful good effort is inherently dependent upon the righteous conviction of the successful. That means that capitalism must also be recognized as a "dependency system" in which the vulnerable need the powerful to give their wealth away. Yes, Capitalism can include powerful forces for good, but I'm not convinced it's an inherently good system. We should say about Capitalism what Winston Churchill once said about democracy: "It is the worst form of government except all the others that have been tried." A good system would eliminate vulnerability and destitution as a likely outcome, regardless of the goodwill of the few. Capitalism is not going away, and self-interest (the all-too-human basis for its global dominance, usually euphemized as "individual rights") is here to stay. I'm just saying that we shouldn't be so proud of free will offerings. A successful person of faith who lives in a capitalist society should use language like "obligation" and "responsibility" and "bearing the burden of the other" to describe their giving. Tu Bishvat Seder, MLK Breakfast, and more! Israeli Folk Dancing on New Years Day! at CNS on January 1st 7:30PM-10:30PM - Come join us for Israeli Folk Dancing on Wednesday, January 1st, from 7:30 PM to 10:30 PM. We'll start off with easy dances for about the first hour. There will be some teaching and lots of dancing. Led by Claire Sherman, Sarita Blum, and Glenn Massarano. If you have any questions, contact Glenn at gmassarano@alumni.ucsd.edu. Join Rabbi Creditor at CNS member Josh Kornbluth's "Sea of Reeds" at the JCC in San Francisco on Jan 5th, where they will also share a post-show chat! Use the code "CREDITOR" online or on the phone for $5 off tickets! cosponsored by the East Bay Minyan, Netivot Shalom, and others! at His Lordships (Berkeley Marina) 199 Seawall Dr. Berkeley. Written by Josh Kornbluth in collaboration with Amy Resnick and David Dower, Sea of Reeds is equal parts monologue, musical, and comedy. Plus, Josh and Shotgun's Artistic Director Patrick Dooley have taken the wonderful opportunity of this remount to add new material and staging! Come see why a lifelong atheist would decide to get bar-mitzvahed in Israel at the age of 52, and just what playing the oboe has to do with the Book of Exodus. The January 5th performance will feature a post-show chat with Rabbi Menachem Creditor of Congregation Netivot Shalom. Use the code CREDITOR online or on the phone for $5 off tickets! more than any one can know. The prophets of old did not chastise the ritually unattuned, but rather the ethically callous. Religion must again address the common good. Israel must recognize the legitimacy of all forms of Judaism, emphatically including Reform and Conservative Judaism, or it will alienate those movements, the just-returned Israeli ambassador to the United States, Michael Oren, said in an interview. Oren, who in October ended a four-year stint as Israel's envoy in Washington, DC, said it was all well and good for Israel to describe itself as "the nation-state of the Jewish people" — a formulation, now routinely used by Prime Minister Benjamin Netanyahu, which Oren said was adopted on his recommendation — but "we've got to stand behind it. Now we've accepted the formula, let's live up to it." In an interview with The Times of Israel, Oren warned that "if Israel does not work to make itself the nation-state of all the Jewish people, and be truly pluralistic and open about this, then we risk losing these people." The former ambassador was commenting on the current state of US Jewry and its relationship with Israel. Asked, first, about the impact of the settlement enterprise on Israeli-Diaspora ties, he said certain Jews were troubled by the expansion of settlements, and others were "dissatisfied we're not building more and faster… I had as much opposition from the American Jewish right as I did from the American Jewish left," he added, "for being in favor of the two-state solution. For effecting the moratorium [on settlement building] in 2010. For prisoner releases." Oren described the American Jewish community as being "similar to what many physicists say is occurring in the universe — that it's expanding and contracting at the same time. So the American community — read the Pew Report — they're contracting through intermarriage and assimilation. However, at the same time, there's a strong kernel of the American Jewish community, not just Orthodox, but also Jews who've gone on Birthright, who are more connected Jewishly and more connected to Israel, and that's expanding… So if you look down the road, 20 or 30 years from now, the American Jewish community may be smaller, but it could also be more Jewishly identified and more connected to Israel." At the same time, he warned, "on the constriction side, you have not only Jews who are disaffected because of Israeli policies, but also because the State of Israel doesn't recognize Reform and Conservative Judaism." He said the only thing that all the rabbis he met with agreed upon — be they Reform, Conservative or Orthodox — was their opposition to the Israeli Chief Rabbinate, which doesn't recognize even most US Orthodox conversions today. More broadly, he said, Israel needed "to recognize all forms of Judaism. We have to recognize the roles of those movements in Judaism within different life-cycle events in Israeli life. We risk alienating them. The amazing thing about the Reform movement is that, after so many years of not being recognized by the State of Israel, they remain so pro-Israeli. That to me is extraordinary." He could not be fully confident, he said, that this would last forever. "I'll sit with American Jewish Reform and Conservative leaders who care passionately about Israel," Oren said. "But they'll say to you: I can't tell you how hurtful it is that the State of Israel doesn't recognize my form of Judaism. It is the worst pain when you say something like that. It's something we have to address as a society if we are to remain the nation-state of the Jewish people." The ex-ambassador's comments came two weeks after Netanyahu became the first prime minister to address the Union for Reform Judaism's biennial US gathering. In a speech via satellite to the event in San Diego, Netanyahu said "Israel is, and it must continue to be, the homeland of the entire Jewish people, the entire Jewish people. That's the place where all Jews — including Reform Jews — experience nothing less than 'audacious hospitality.'" He added that he was "committed to doing everything in my power to ensure that all Jews feel connected to Israel and to each other." The Times of Israel's full interview with Michael Oren will appear later this week. 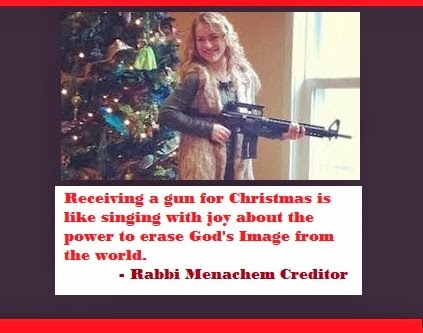 Receiving a gun for Christmas is like singing with joy about the power to erase God's Image from the world. Va'Era #ParshaTweet: Redemption usually includes trauma. God does not wish pain upon us. May liberation for all be accompanied by peace. Breaking: Uganda's anti-gay bill passed in Parliament today. We call on President Museveni to veto it once & for all. 42 U.S. university and college presidents have publicly rejected the boycott of #Israel. Not one has endorsed it. As a Yeshivah high school student, I was told to not enjoy Christmas lights, "tainted" as they were by non-Jewish "cooties." And, since I lived in a particularly lawn-obsessed neighborhood on Long Island, that meant ducking for cover every third house. The homes abutting my childhood shul were particularly hard to miss, with people driving from far away to witness a million-bulb spectacle, the carbon-footprint of which has yet to be determined. When I got to college, though, something changed. First of all, the white lights adorning Columbia University's college walk didn't in the least resemble the garish ones I remembered. Secondly, I was done heeding the Jewish-insularists of my Yeshivah days. Most of all, I was a college student whose heart swelled with the romance in the college air - what could be more romantic than mystic lights on a cold winter night? Which leads me to this thought. We, American Jewish parents, guardians of the faith, have a choice. 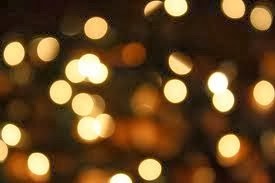 Do we try to diminish the magic of the lights our children see? We don't stand a chance. And, furthermore, do we really not see the magic ourselves? Are we afraid of Christmas voodoo? Or, are we secretly, deep down, happy to see the lights on these dark nights? So, if we are not going to pretend to not enjoy Christmas lights, let's really talk about what's going on. It's beautiful. Human beings ache for a magic that illuminates the darkness, that shines goodness into a sometimes cruel world. We don't need, as Jews, to be afraid of beauty. In fact, the more we try to look away, the stronger the magnetic pull of Christmas becomes. In America, it's everywhere. Sometimes garish, sometimes classy, sometimes commercial, sometimes spiritual. It's just there. Everywhere. We live in it. And it can be very, very hard. So here's the thought: It was a blessing this year that Thanksgiving and Channukah coincided, a reminder to not confuse Channukah's modest lights with Christmas' spectacle-of-the-trees. If you are concerned that you and your children are becoming seduced by the lights, consider this: magic is desperately needed in this world. Every Friday night and Saturday night Jews are caled to banish the darkness with fire, bringing primal creative force into the world. Have you ever looked at someone else's eyes looking into the Shabbat candles' flames? Shabbat is our magic. Its cheer is waiting to pervade your home and your heart every week. The world needs more light, more spirit, more goodness. So love illumination when you encounter it, and let your precious Jewish light shine! "Blessed, Complicated Water" or "Sitting at China Beach, Remembering Cape Coast"
@rabbicreditor @Brady_EasternCT @DemandAction @RabbiAssembly Ancient Israel awarringnation.David a murderer and whore.Get a grip.NYJew here. @KentAtwater @rabbicreditor @Brady_EasternCT @RabbiAssembly If some of my cousins were armed perhaps they would've avoided the oven.